Our client base is wide and varied, hence the below listed projects form only a small part of the overall works that we do annually. Regardless of the materials or attention to detail required, our approach to your project will be flexible and honest. At times advise or highlight areas where cost savings or improvements in design can be made as a standard service. 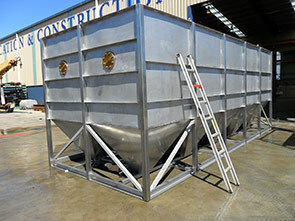 Marine Aquaculture, Caterpillar Mining Equipment, Factory Equipment & Pipeline Installations, Rail Carriages and Bogies, Mining Overland Pipeline Installations, Hydro Asset Refurbishments, New Build PVC Factory Equipment Structures, 180 Ton Barges, 137 Ton De-Barker Drums, Stainless Steel Clarifiers and Pressure Vessels, Customising of Shipping Containers, Heavy Industrial Shutdown Works, Mining Conveyors, Gantry Crane Beams, Heat Exchanger New Builds & Repairs, Ultra High Water Blasting, Bogie Equilisers for Bulk Mining Material Handling, Custom Access Platforms and Refurbishment to Various Mining Equipment and Oil and Gas Industry Pipework. 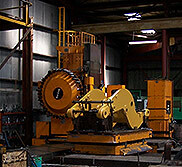 We can and do supply fabricated goods to anywhere in Australia.